Communication through social media has become a way of life, especially for the younger generation, and will continue to increase. Although indiscriminate posting on social media by nurses hold a number of pitfalls, nurses should embrace this evolving technology in order to keep up with the changing needs and demands of contemporary society. The creative use of social media has limitless potential in nursing education, nursing management, and health care. It is still a vast, mostly unexplored territory. Nursing students are skilled in the use of social media and will welcome their use in education. Online groups can be used very effectively to create interactive and self-directed learning opportunities. The educator can, for example, post links to web-based articles and YouTube videos for the students to read and watch in preparation for the next classroom session. Instead of the information being presented to the students by the teacher, classroom sessions can be used for clarification, group discussions, and role plays. 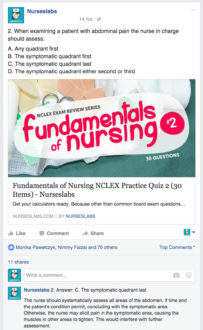 On our official Facebook page, we post practice questions every day to help student nurses review for their exams. Groups can be created by which the educator can connect with their students to share interesting content related to their studies and to inform them of special lectures, test timetables, and other events. 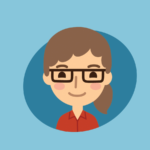 An account such as Twitter can even connect the educator with students who are on clinical practice assignments so that she can answer questions, provide guidance and support. There could also be a planned communication session every week at a particular time. Students themselves can form study support groups through which they can exchange questions and explanations as well as support each other in general. They could also share interesting content related to the topic they are studying, such as the practice quizzes posted on this site. Nurses can join any of countless nursing groups and pages on Facebook and other social media. These are either for nurses in general or for nurses specializing in a particular field. They serve to share information on developments and issues in nursing and health care and to network with other nurses locally or worldwide. These groups also enhance morale within the nursing profession – just think of the warm feeling you get from a meme or quote about how wonderful nurses are. One of the most popular nursing groups on Facebook is SMYS that aims to unify the voices of nurses and other healthcare professionals. The instantaneous and wide sharing of content is one of the major advantages of social media for professional development. This characteristic can be used to start a journal club, either for a special interest group or within an organization. Links to journal articles are posted to the group and, once members have read the article, there can be a discussion in the group about the content of the article, its value for nursing practice and whether and how the research can be implemented in the clinical situation. Within a specific workplace, nurses can also have a dedicated group where they can ask questions, express feelings, reflect and provide general support for each other. 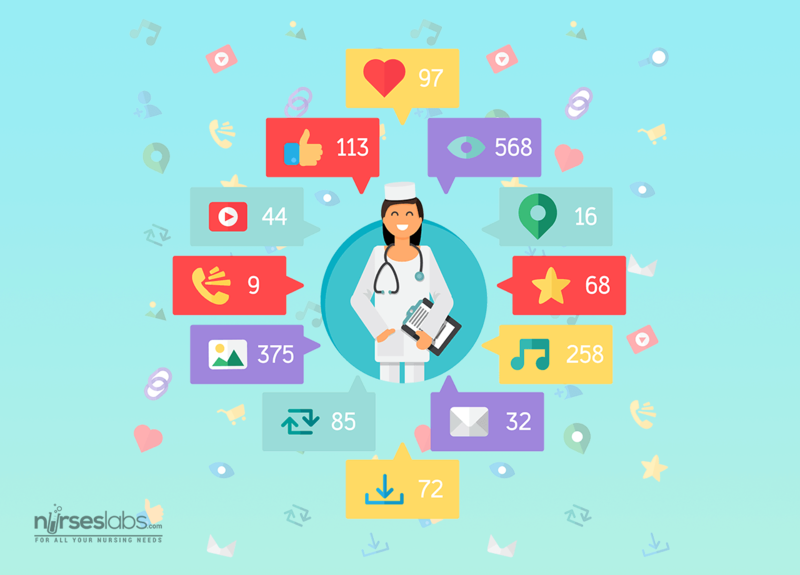 Nurse managers should become familiar with social media, using it to improve communication, obtain staff participation in management decisions and enhance staff morale. Imagine the positive influence the above communication will have on staff engagement and cohesion among nurses, as well as on staff recruitment and the branding of the health care institution. Nursing managers can also use a social media application, dedicated and always attended to, to provide nurses with advice and feedback about problems in real time. To make effective use of social media in the workplace, nurse managers should also actively engage their staff in developing policy and new methods in information sharing, collaboration on projects, education and patient care. Worldwide there are numerous developments and projects in using social media to enhance health care for patients and communities. They can be used effectively in communication with patients and patient monitoring. A chat line can be made available for newly discharged patients where they can safely and discreetly communicate with a member of the nursing staff to confirm discharge instructions, enquire about symptoms they are experiencing which might indicate a complication, or even post images of their wounds so that the nurse can monitor the healing process. The nurse can even monitor a patient’s wound dressing technique or method of administering medication via a video. Other uses include medication reminders and confirming upcoming appointments. Patients can be referred to social media groups which offer support and information for individuals with specific long-term conditions. A group can even be created by a health care institution for patients with specific long-term conditions, or even for new mothers, where they can provide each other with support. A nurse with specialized knowledge could form part of the group to give professional advice, patient education and information about events and new developments in treatments. A number of mobile-based online applications, which interact with social media, have been developed for monitoring and assessing patient information. One such application, for teenage diabetics, prompts users to enter blood glucose data. Trends are tracked and remotely monitored by health care professionals. Social media have also proved to be a powerful tool in public advocacy campaigns. They can be used effectively by nurses and organizations to advocate for change in local, regional and national nursing and health issues. Nurses might feel anxious about using social media in health care but the profession should evolve with developments in the society which they serve. As long as the core ethical principles of nursing are kept in mind, new technology should be embraced for its potential benefits in nursing and health care.